Originally created in Indiana, USA, Bubblegum is a perfect marijuana hybrid containing 50% Sativa and 50% Indica genetics. Now available in autoflowering form, these fully feminized seeds produce plants and buds with similar traits and characteristics as the original , but are much faster to mature and easier to grow, whether cultivated indoors or outside. Bubblegum autoflowering seeds are the perfect choice for planting outdoors, producing regular harvests throughout the Summer. Their ability to flower without the need for long hours of regular darkness produces plants that grow and flower simultaneously. Usually planted outdoors during the middle of Spring, Bubblegum autoflowering seeds produce their best harvests during the height of Summer when they are subjected to long hours of daily sunlight. Grown indoors, the plants will require a minimum of 18 hours of light per day to produce their best harvests. Heights of approximately 5 foot tall are average, requiring around 9 weeks to completely mature from planting as a seedling. 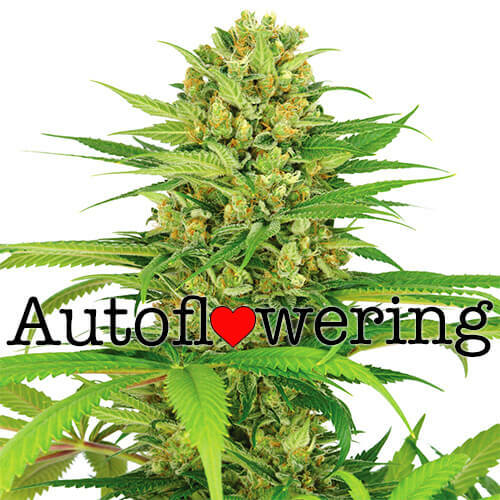 Autoflowering seeds are considered the easiest forms of marijuana to grow and are an ideal choice for both new growers and those looking for a fast harvest. Fully feminized and guaranteed to germinate, they are often started indoors before planting outside at the start of the season, producing harvests of around 5 ounces per plant from early Summer, through until the Fall. Autoflowering Bubblegum seeds produce buds identical to those produced from traditional feminized seeds. 17% THC levels and a medium CBD content delivers a euphoric high, that’s both relaxing and invigorating. Available now in packs of 5, 10 and 20 Bubblegum feminized autoflowering seeds are becoming a popular choice across many parts of the USA, Canada and Europe, providing a fast and easy way to produce sweet candy flavored buds. Why wait till the end of the season for your plants to mature, when you can enjoy autoflowering bubblegum buds from the beginning of Summer through until the Fall. You can buy Bubblegum Auto seeds in packs of 5, 10 and 20 seed packs with prices starting from as little as $89.00.